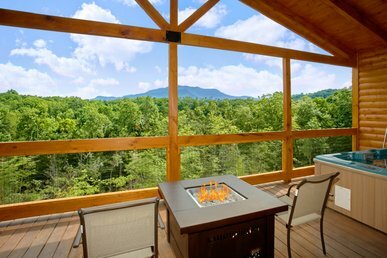 Welcome to paradise: That may be your first thought as you pull up the drive to Fawn Cabin, nestled among towering trees in the foothills of the Great Smoky Mountains. 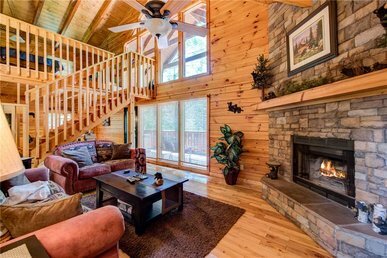 A true log cabin with a covered wraparound porch, it’s secluded enough to provide utmost privacy, making it ideal for a honeymoon or a romantic getaway. 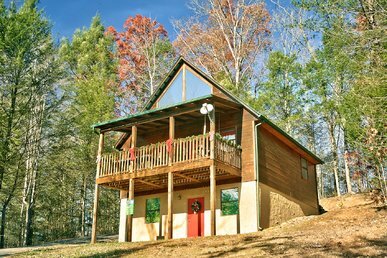 At the same time, it’s within the Gatlinburg Arts and Crafts Loop, an 8-mile trail of more than 100 galleries, studios, and craft shops offering everything from candles to quilts, pottery to paintings. 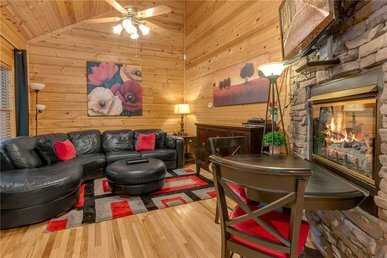 It’s also just a 5-minute drive from the Gatlinburg Community Center, with a state-of-the-art fitness center where you can bowl, shoot pool or hoops, play racquetball, or swim in the indoor pool, to name just a few pursuits. 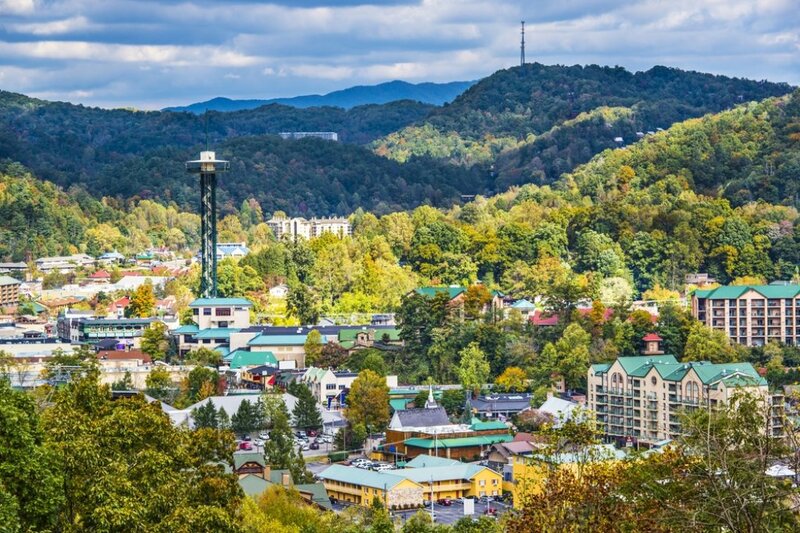 Just a few minutes further is downtown Gatlinburg, where you’ll find everything from mini golf to an aquarium to the state’s first pancake house. 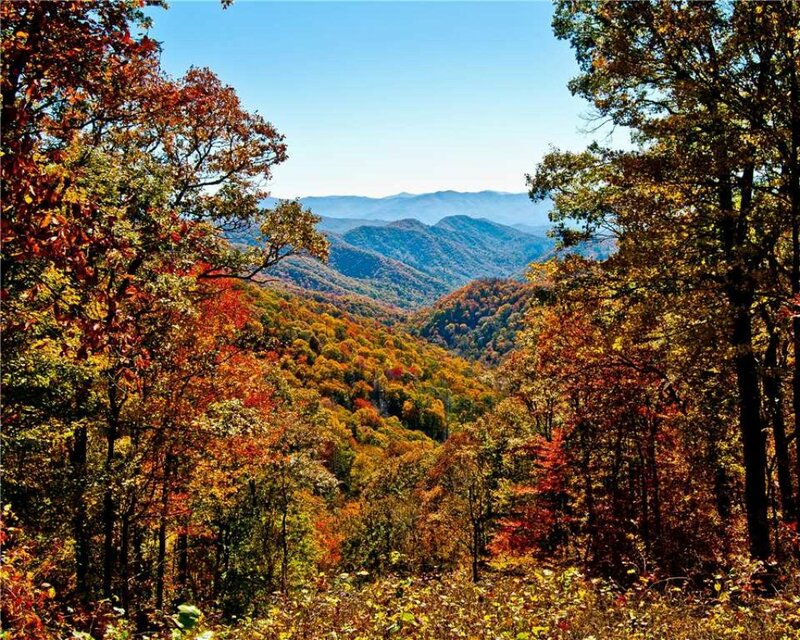 And let’s not forget the Great Smoky Mountains National Park, with its hiking trails, historic cabins, waterfalls, and wildlife ranging from black bears to elk. 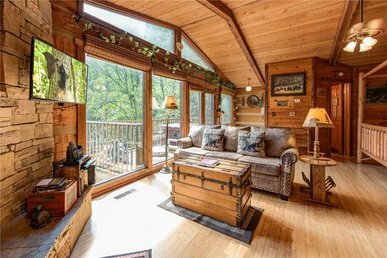 Once you see how restful and restorative Fawn Cabin itself is, though, you may want to spend most of your time simply hanging out. 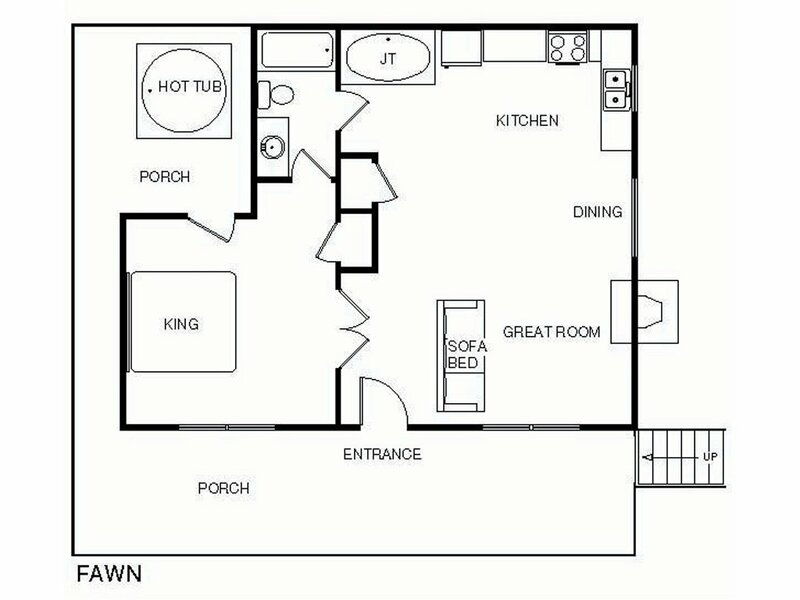 For instance, when you stay here you can enjoy the luxury of an outdoor hot tub and an indoor jetted bath. The hot tub is large enough for 2 (so romantic! 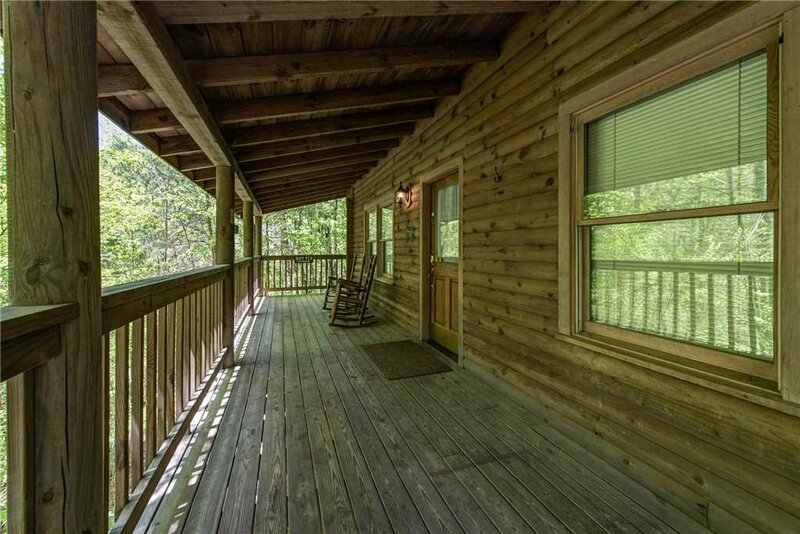 ), and its prime position on the porch lets you relish the surrounding woodlands, the fresh mountain breeze, and the serenading of the birds as you loll among the steamy, bubbling water. The indoor tub is perfect for some “me” time, especially when you return after a day of skiing, golfing, rafting, or hiking. Of course, you can’t spend your entire vacation in a tub (tempting though that may be!). 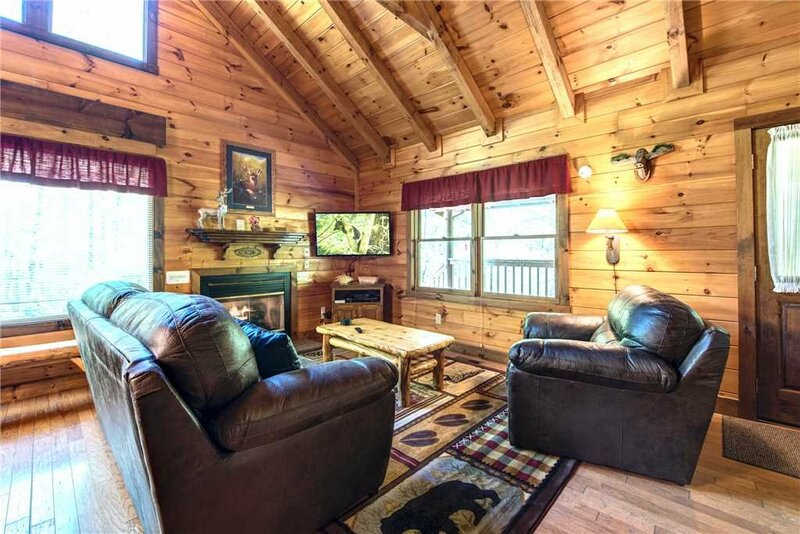 Fortunately, Fawn Cabin’s living room also encourages relaxation. The plush sofa and armchair are so comfortable. Curl up with that book you never have time to read when you’re at home, or stretch out and watch a movie or play video games on the TV. The sofa, by the way, converts to a bed for 2, enabling up to 4 people to stay overnight. 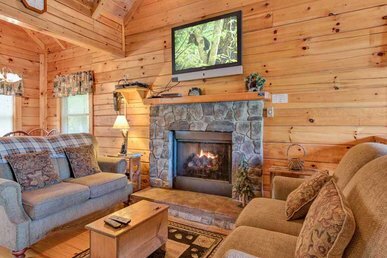 In winter you can snuggle in front of the gas fireplace, whose warm glow will enhance the luster of the wood walls, floor, and ceiling. 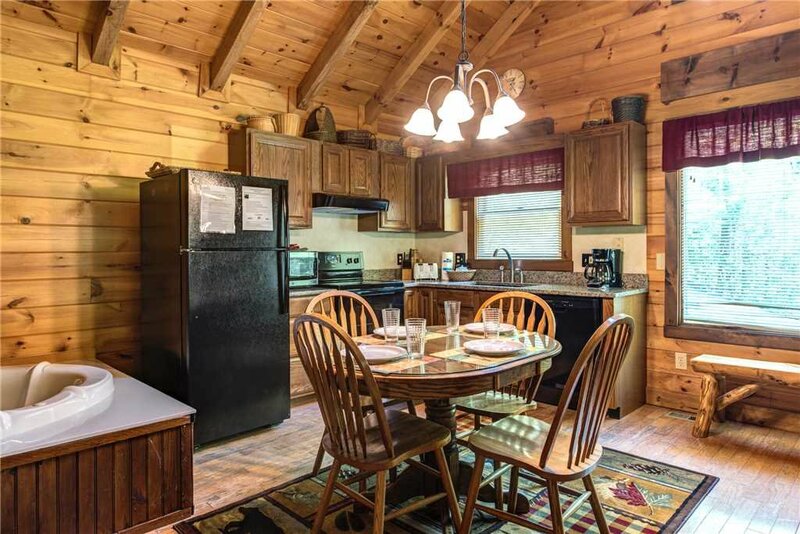 The cabin’s open main space includes a dining table for 4—no need to eat every meal in a restaurant (unless you want to!). 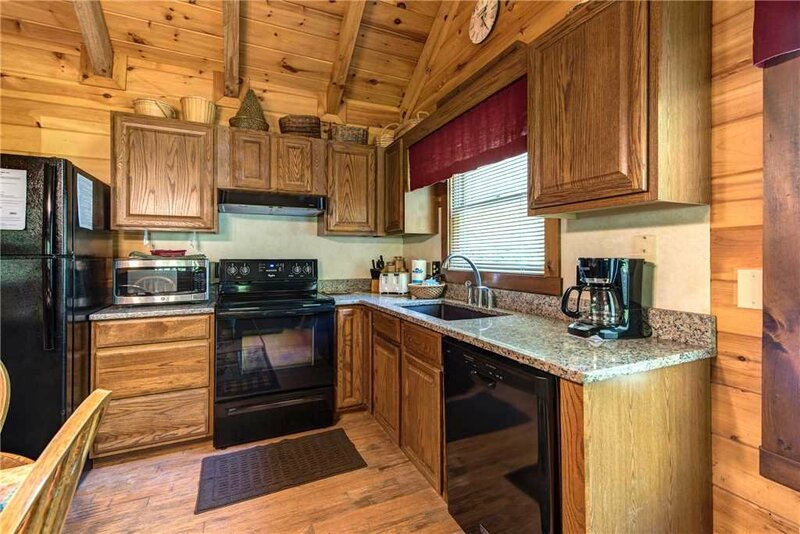 The kitchen is equipped with cookware, tableware, and appliances ranging from a fridge/freezer to a coffee maker. 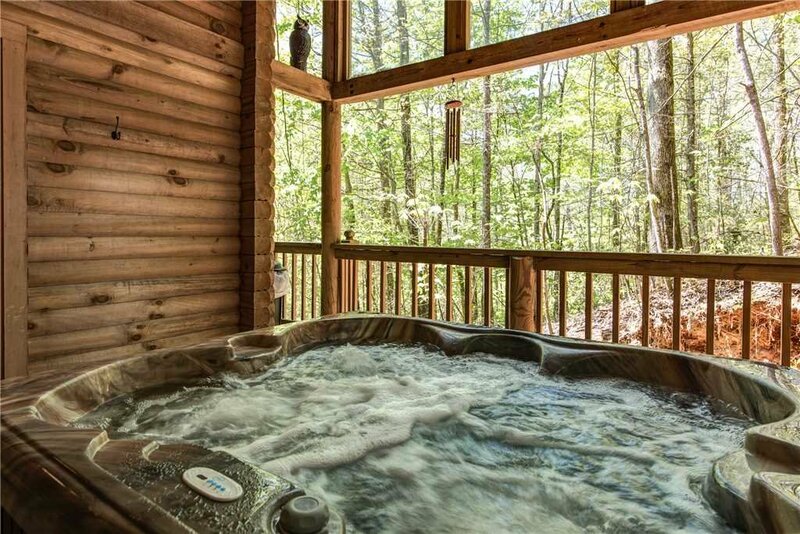 There’s a dishwasher too; after all, why scrub dishes when you can be lazing in a hot tub? 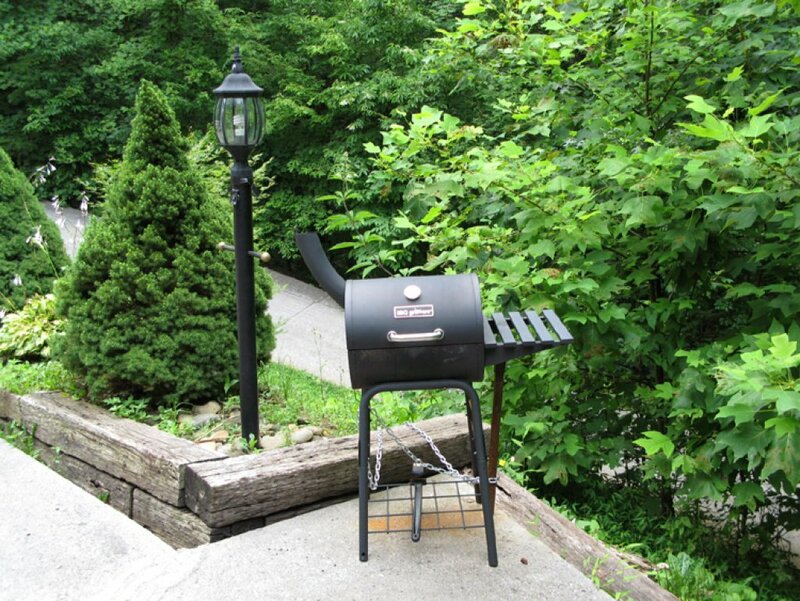 If prefer cooking outdoors, there’s a charcoal grill at your disposal. 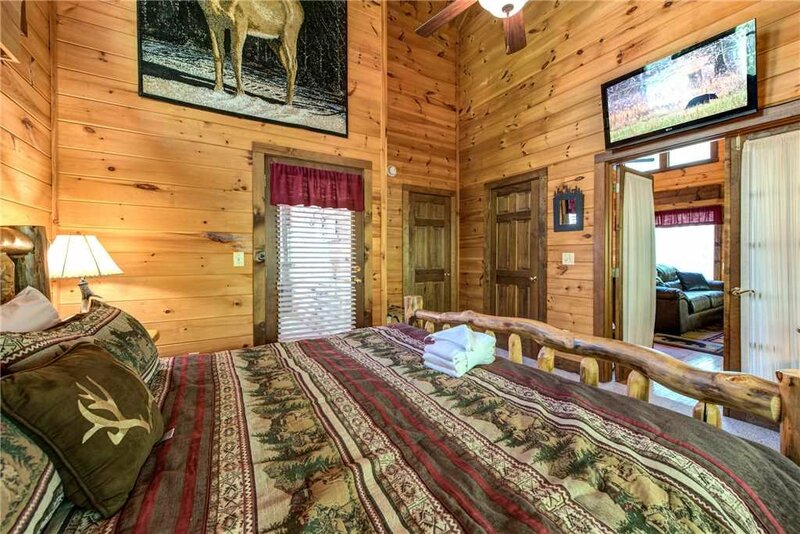 The bedroom is furnished in the same comfortable, traditional cabin style as the rest of the home. 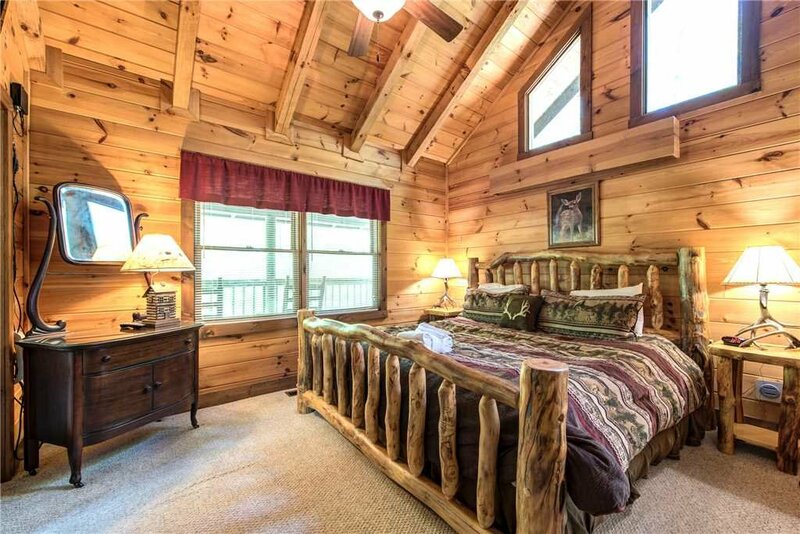 From the king-size log-frame bed you have a view of the porch and the woods; you just might hear the melodic hooting of owls as you drift to sleep beneath the lofty cathedral ceiling. 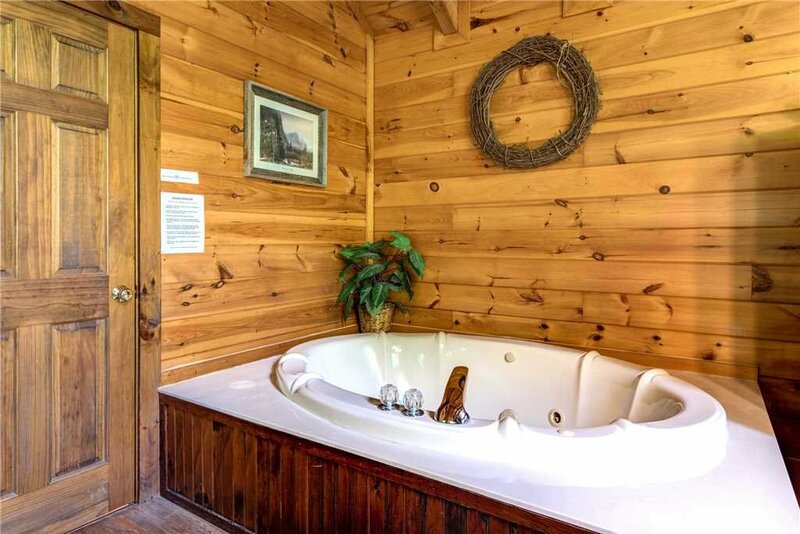 One of the bedroom doors leads directly to the hot tub—how convenient (and romantic!) is that? When it comes to romance, however, sometimes the simple pleasures are the best. 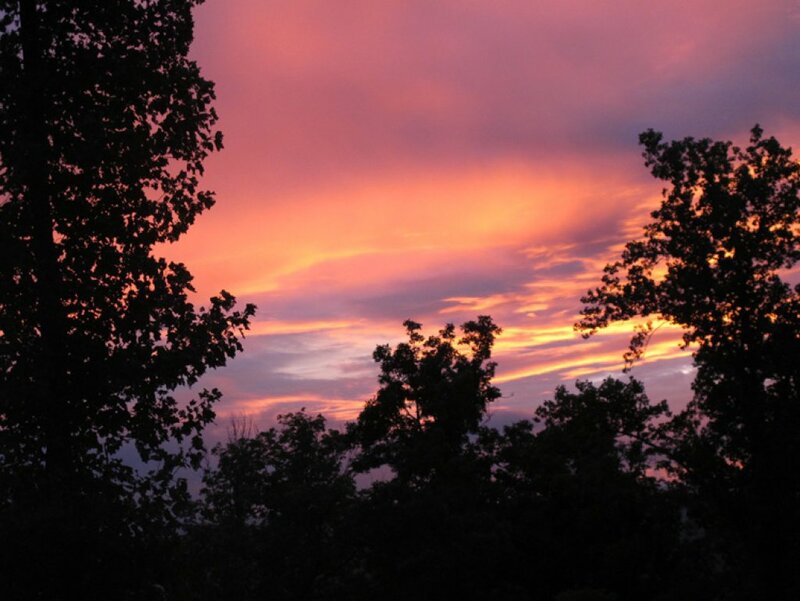 So open a bottle of wine, then sit on the porch bench or rocking chairs with your partner, and revel in the serenity of your surroundings… and in each other’s company. 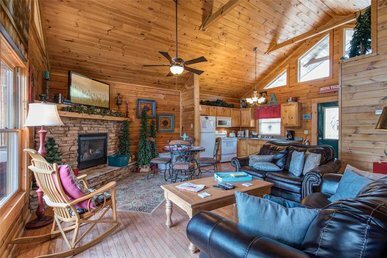 On the other hand, if you’re traveling with a larger group, your stay here can be packaged with neighboring properties Buckhorn and Doe’s Den. 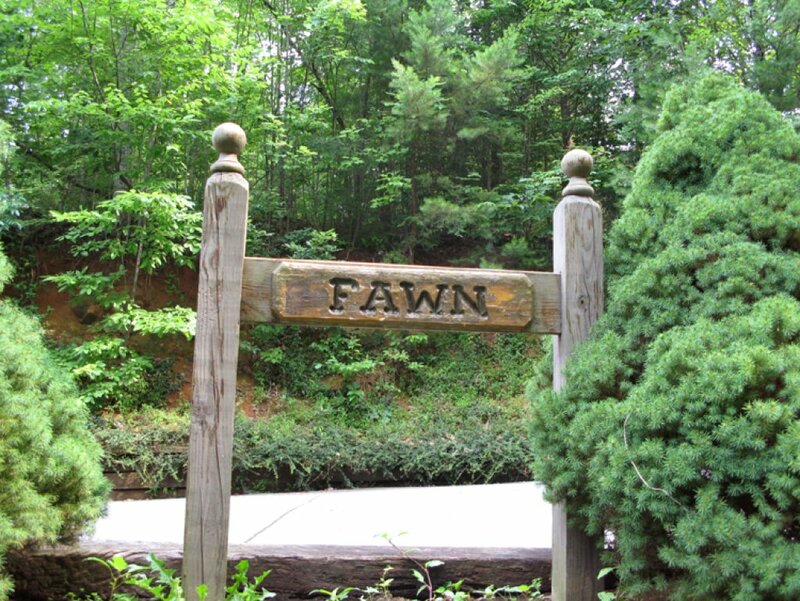 When you stay at Fawn Cabin, you can enjoy activity-filled days and restful, romantic nights—or kick back all day and paint downtown Gatlinburg red every evening. The choice is yours. First, though, you have to book your stay—so go on, make your reservation today! 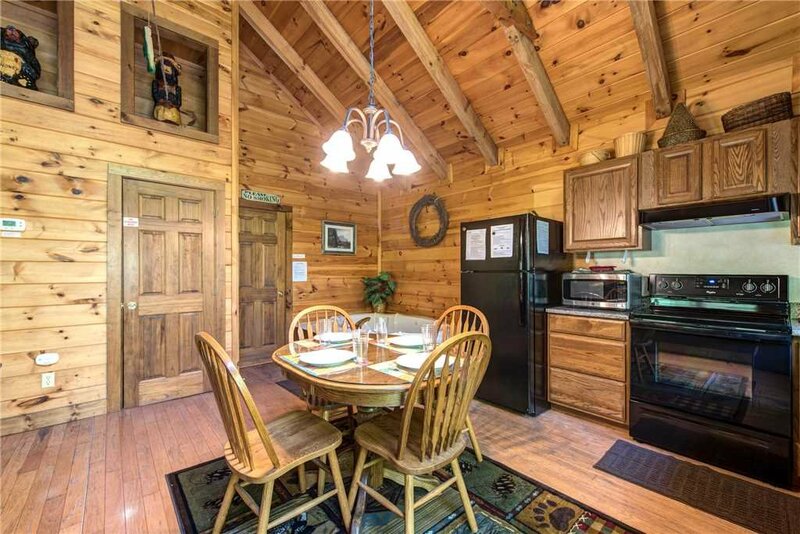 Well maintained and clean cabin just minutes from town. If you want privacy, this is the place. I was very pleased with the overall experience. I thoroughly enjoyed the cabin and location due to its exclusivity. 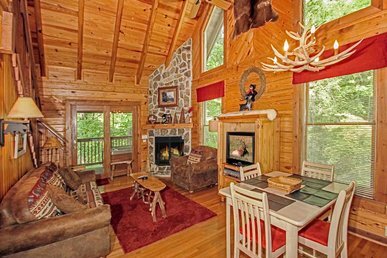 However, the online reservation process was difficult due to the lack of information and contact with Jackson Mountain Homes. 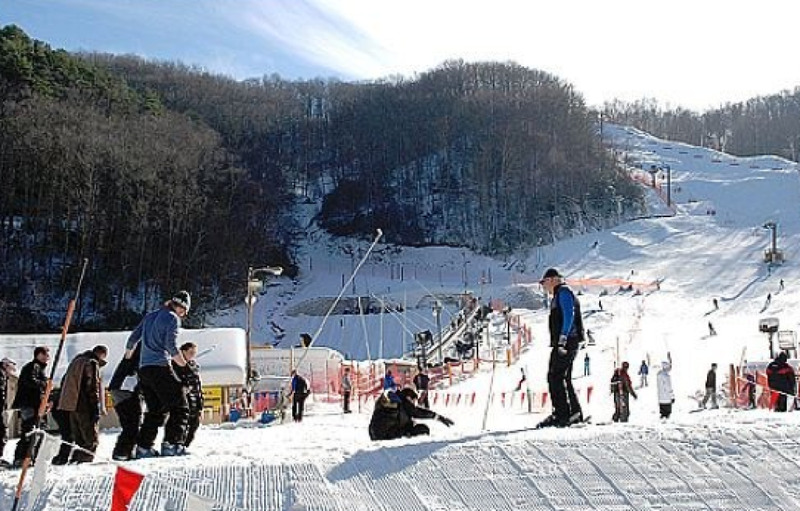 Although it was a helpful tool, the app which provides the user with information about excursions in and around Gatlinburg should be updated as well. 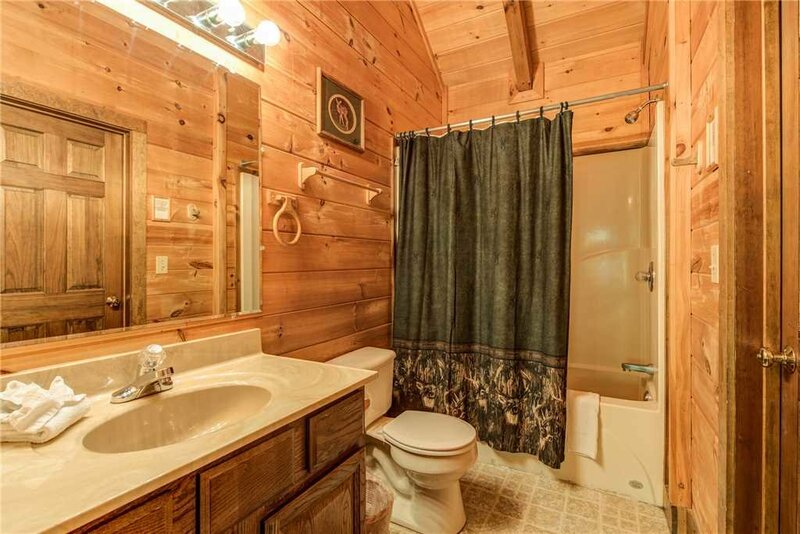 The cabin is beautiful, clean and private. We would defiantly stay here again. 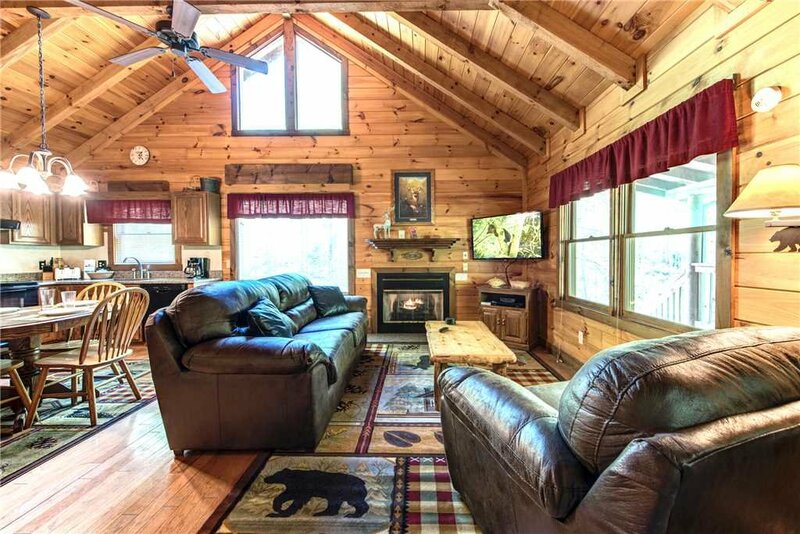 The cabin was nice and relaxing. The wifi wasn\'t dependable, could only be used late night or early morning and was very slow. The location wasn\'t terrible but could have been closer to every thing. I would definitely recommend it if you are going to spend a lot of time there, and cook there. We had never stayed in a cabin and wanted the experience, but will stay in a hotel the next time. Great location and great home for it! 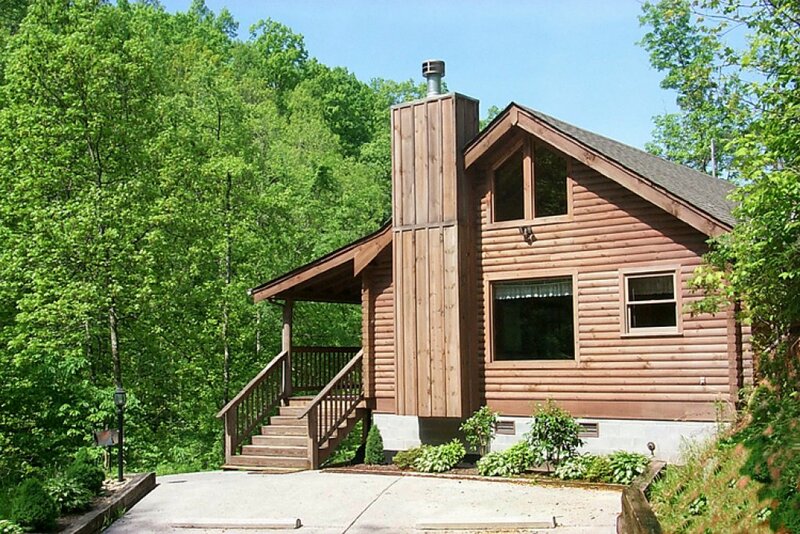 I\'ve really enjoyed this stay - the cabin was neat, tidy, spacious and it\'s located in a very nice place. The only thing that didn\'t work was internet - our wi-fi connection was lost and our mobile phones didn\'t have good signal. so, if you plan to work during your vacation and you\'ll need access to internet for it, it\'s better to look for a less hidden place. Beautiful cottage. All worked good, except no wifi and spotty internet signal. Highly recommend this place to anyoneâ€‹ visiting the smokys!